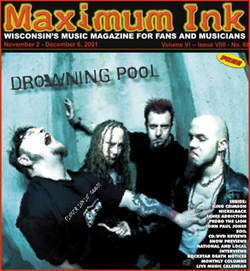 Drowning Pool on the cover of Maximum Ink in November 2001 RIP Dave! Don’t let their casual charm and effervescent personalities fool you, on the package tour dubbed Music As A Weapon, Drowning Pool ‘s performance is the equivalent of stumbling into the ammunition hold and dropping a lit stick of dynamite. Sure, Disturbed have earned their stripes and deserve their place atop the tour they assembled, but if the headliners are the United States Navy, Drowning Pool are the Navy Seals, sneaking up on the unsuspecting crowd with stealth, and attacking with a sonic spray that numbs the senses. Granted, it’s getting harder for Drowning Pool to “sneak up” on anyone, especially given the breakthrough success of their debut single “Bodies,” one of the most potent metal hits this side of Pantera ‘s “Walk.” The song is a smash even becoming the theme music for the World Wrestling Federation’s recent plotlines, but the acclaim it’s brought with it isn’t all it’s cracked up to be. As the fickle hand of fate would have it, the single that helped conquer this summer’s OZZfest never had the chance to hurt the band, as soon after the attacks of September 11, the track became one of many “blacklisted” songs by numerous radio stations nationwide. Overnight, “Let the bodies hit the floor” went from a rallying cry, to a line that radio didn’t want uttered on their airwaves. But leave it to a band sponsored by Jaegermeister to turn adversity to advantage. Up until Drowning Pool, there isn’t much on the Music As A Weapon tour that packs enough dynamo to truly turn heads, but that changes when the chants of “Let Bin Laden hit the floor” echo up to the rafters. It’s heavy metal, damn it, and whether radio embraces it or not, Drowning Pool plan on taking it to the masses. Despite the aggressive overtones, there’s actually something happening lyrically within Drowning Pool that is a lot deeper than your typical radio-fed fodder. In particular, much of the religious right. Don’t think for a second that the album title Sinner and the cover, which depicts the fundamentalist act of the laying of hands, isn’t based in irony.